Experience the thrill of racing against other sailboats. It's a great way to improve skills! Racing is one of the best ways to improve your sailing skills and knowledge. Learn to perfect your sail trim, plot a strategic course, close quarter tactics and get involved in the Jacomo Sailing Club racing community. Club members will help you learn racing tactics and rules. Sunday Racing - Dinghies - Club Series. There are two races, each taking about two hours, including starts, finishes, etc. Racing boats normally return to the launching areas around 5:30 pm. (weather permitting). Saturday Racing - Sailboats 20 feet and over - Commodore Cruiser Series. There will be one longer race, more suitable to cruiser style boats. 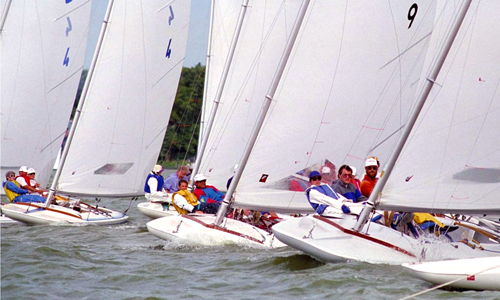 The first race starts at 1:30 pm, which means typical race days see the racing sailors arrive at the lake around 12 noon, and most sailboats will depart the Lake Jacomo Marina/Dock and Sailboat Cove between 12:15 pm and 12:45 pm. If you are starting at the South Boat Docks, give yourself an extra 30-40 minutes to get to the starting line.